Jumeirah’s award-winning Talise Ottoman Spa recently introduced a range of new wellness rituals and therapies that aim to nurture mind, body and beyond. From Ottoman Opulence to Holistic Healing and to Western and Asian Indulgence, the spa uses 100% natural ingredients by Sodashi, named after a Sanskirt word, meaning wholeness, purity and radiance. The aforementioned Ottoman Opulence ritual is a journey that blends oud, frankincense and rose, complemented by authentic techniques to relieve stress and bring about a deep sense of renewal. The experience includes a session in the Signature Talise Hammam, with an Imperial back massage followed by Oud Radiance Facial using warm Rosequartz crystals, herbal extracts utilizing the Arabian Oud Oil to leave your body renewed and your skin glowing. The 150-minute treatment is priced at AED 1,200. The spa uses 100% natural ingredients by Sodashi, which means wholeness. If you’re looking to get 2019 off to a healthy start, Stables Fitness Centre Meliã Desert Palm is hosting a regular Fitness Boot Camp. Boost your stamina and shed the holiday weight with 50-minute sessions, focusing on military-style exercises and functional movements, including push-ups, squats, sprints and sit-ups. Here’s your chance to work out on the hotel’s lush polo fields and sweat outside the gym. The sessions kick off January 7 and take place weekdays at 6.30am. A week of sessions will cost just AED 200, with a month of unlimited sessions priced at AED 700, ranging to a three-month unlimited package for AED 1,900. Prepare to feel great from the inside and out with a host of new expert treatments and workshops available at Willow Stream Spa, located at Fairmont The Palm. London-based rejuvenation and anti-ageing aesthetic treatment pioneer Dr Rita Rakus will be returning to launch her sixth treatment in partnership with the hotel, with new Deesee Pro LED treatments available from January 26. In addition, world-renowned Energy Healer Lee Whyberd will launch a one-week workshop from January 27. The workshops and new Dr Rita Rakus Deesee treatments will add to the resorts health and wellness brand promise “Be. Your. Best”, a full 360-degree wellness offering aimed at inspiring guests to transform themselves through an extensive wellbeing and active lifestyle programme. The Spa at Address Downtown is a peaceful wellness sanctuary where restorative treatments are gently administered by accomplished therapists in a tranquil setting. Every aspect of the décor and ambience has been thoughtfully considered to complement holistic wellbeing, from the elegant, understated décor to the soothing fragrance of the signature Address Downtown scent. When you purchase a gift certificate from the spa reception, you’ll be treated to a complimentary candle or diffuser set– perfect for upcoming birthdays, special occasions and the season of wellness. Gift certificates come in an embossed envelope and start from AED 750 in value. The gift certificates can be used for a variety of treatments, from reflexology massages to results-driven facials. 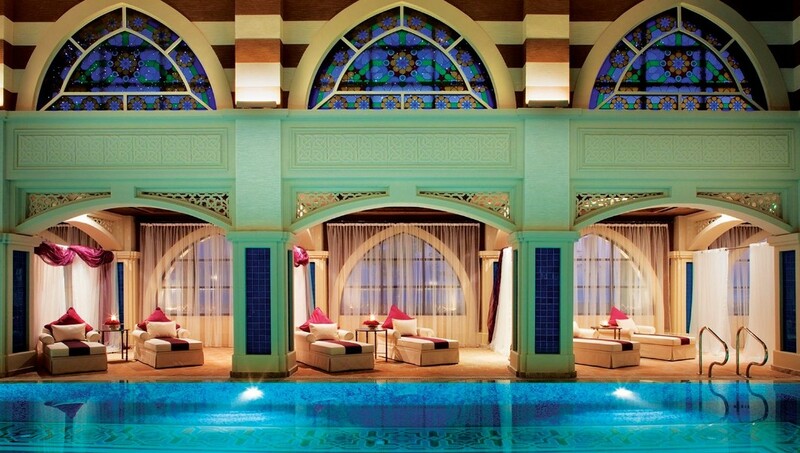 Hidden in the depths of the long anticipated Emerald Palace Kempinski is the stunning Cinq Mondes Spa. A spa day is about the relaxation and rejuvenating of body and mind and laying to rest the struggles of everyday life – and there’s no better place than in this ultra-modern, 3,000sqm sanctuary of wellness. Cinq Mondes Spa is a welcome escape from city life with a spa menu featuring an impressive choice of Cinq Mondes treatments, inspired by beauty rituals from around the world, combining eastern and western holistic practices and wellness products. The Wellness Club boasts the largest indoor swimming pool in Dubai and helps guests keep fit and achieve their personal targets even while on holiday. Guests can make use of Technogym equipment suitable for all fitness levels, whilst personal training is also available with a dedicated dance studio perfect for a yoga class. Some of the exquisite features included in this rather special spa are the Hammam rooms – a variety of both steam rooms and saunas with a relaxation room to recline and enjoy herbal teas after your massage. Additionally, the facility offers experience showers with a number of different settings, ranging from tropical rain to cool mist. Spend a day in the lap of luxury at Emerald Palace, beginning with a limousine pick-up. Why not take advantage of one of the spa’s current special offers? Spend a day in the lap of luxury at Emerald Palace Kempinski Dubai beginning with a chauffeur-driven limousine to whisk you to your palace by the sea. Enjoy full access to a host of regal amenities and facilities, from our exclusive white-sand beach to the world-class spa and its invigorating treatments as well as the indoor and outdoor pools. Once you’ve been preened, dine on a sumptuous three-course menu at one of the hotel’s fine dining restaurants before concluding the experience with a return trip in a luxurious limo back home. With the surge of technology in our modern day-to-day life, the stresses of our fast-paced lifestyle need to be mitigated. Al Maha Desert Resort, home to the Timeless Spa, has developed a unique spa ritual to provide a new kind of calming from the outside world, clear mental clutter and assist you in developing a digitally balanced lifestyle. Before proceeding to the treatment rooms, guests are encouraged to turn off their mobile devices and leave it in a special safe during the whole experience. The treatment lasts for a total of 75 minutes, beginning with a 20-minute, warm hydrotherapy bath infused with a blend of 24 purest organic essential oils. Harnessing the goodness of premium essential oils, including lavender, jasmine and Brazilian rosewood – the relaxing treatment focuses on soothing sore muscles and also clears up the skin. The bath is followed by deep breathing exercises along with guided meditation to help you disconnect, relax and let go of your worries and prepare you for the massage. Priced at AED 525, the massage is mainly concentrated on hands, arms, neck and shoulders – all areas that get affected by repeated use of devices and technology. The treatment concludes with a fragrant and calming rose or chamomile tea in the silence of the relaxation majlis or you could enjoy the brew by lounging at the Timeless Spa’s infinity pool, overlooking the infinite dunes where gazelles and Oryx roam around in their natural habitat. As Dubai strives to be the happiest city on earth, Rixos The Palm Dubai has been inspired to create a Wellness Drive program, aiming to promote emotional health and positive energy amongst its guests throughout their stay. As part of the property’s Wellness Drive program, the resort invites guests to come experience a new Holistic Therapy & Lifestyle Solutions by wellness expert Dr. Smitha Prabhakar and discover their “energy shifts”. Packages include five meditation sessions with a complimentary before and after energy analysis (AED 500 per person) and a 10 meditation session package with a wellness consultation, priced at AED 800.